Betrand Delanoë (left), the current Mayor of Paris, has this week announced plans to ban all motorbikes and scooters from Paris if they are older than 10 years. Proposals, if accepted by the Paris Council, will come into force in 2014, thus banning all motorcycles manufactured in 2004 and before. Delanoë believes that banning older bikes from the French capital, together with cars older than 17 years, would significantly cut pollution as a result of the reduced traffic on the Paris roads. 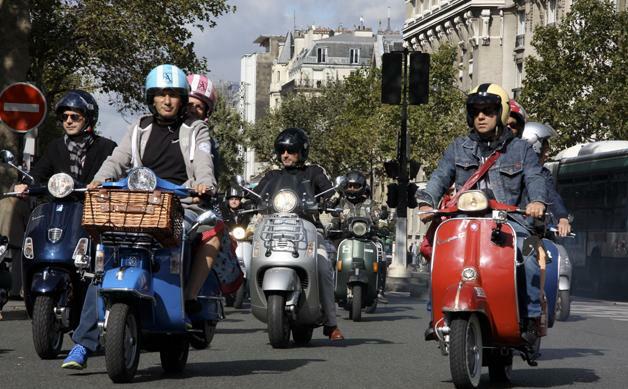 This supercedes plans from the previous French Minister for Ecology, Nathalie Kosciusko-Morizet, who had also put forward proposals to ban older motorbikes and scooters from city centres across the nation in an attempt to improve the quality of the air that French citizens breathe outside their home. Although the new Minister for Ecology, Delphine Batho, has decided to put the stupid proposals of her predecessor to bed, the Mayor of Paris has put forward the same proposals again. Delanoë not only intends to ban older motorcycles from central Paris but also from the immediate surburbs surrounding the French capital. He also proposes to force all vehicles to limit their speed at 30kms per hour (18 miles per hour) in the city, again in an attempt to cut pollution. Needless to say that Delanoë’s proposals are being heavily criticised, not only among the motorcycling community, but also among the wider community who argue that motorcycles are the solution to traffic and pollution issues in large cities such as Paris. Motorcycles dot not cause a problem, they in fact save substantial road space, alleviate traffic, pollution and parking space thanks to their minuscule size compared with cars, lorries, coaches and buses. It’s also been demonstrated several times that the Carbon Footprint of a motorcycle is much lower than that of a car, even in the case of an older motorcycle. These older scooters will be banned from Paris if the proposals put forward by Bertrand Delanoë go ahead. The social impact of the proposals also represent a major concern. Motorcycles represent a cheaper mode of transport for many individuals with financial difficulties, who cannot necessarily afford the ever increasing cost of the public transport and/or enjoying the use of a car. Banning older motorcycles from Paris would imply the scrapping of hundreds of motorbikes and scooters whilst their owners would not necessarily be able to afford replacements. Delanoë will officially present his ridiculous plans on 12 November and one can only hope that the Paris Council will see sense and reject them. If not, you can rest assured that the most famous and well respected Fédération Française des Motards en Colère – FFMC – (French Federation of Angry Bikers) will put considerable pressure on Delanoë to abandon his plans by organising enormous protests that will bring Paris to a complete standstill over and over again until the Mayor sees sense and puts his proposals to bed. Why not click here to see for yourself what the FFMC is able to do by gathering more than 15,000 bikers to gridlock the city and bring complete misery for hours!